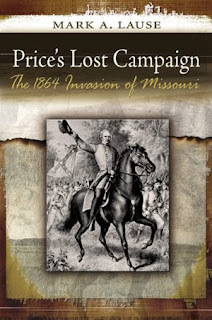 If the devil is truly in the details, Old Scratch is alive and well in the pages of Mark Lause’s meticulous investigation of the Confederate invasion of Missouri in September-October 1864, a last ditch attempt to liberate the state from occupying Union forces and restore its pro-secessionist government in the upcoming November elections. Lause explains why the South failed to achieve any of its unrealistic strategic goals and vividly describes the reign of death and destruction that erupted along the path of the invaders. The author of several authoritative Civil War books and a proud son of the Show Me state, Lause, at times, lets his encyclopedic knowledge of Major General Sterling Price’s invasion get in the way of effectively conveying the important story he has to tell. Part of a historian’s responsibility is to sift and winnow an immense amount of information and mold it into a well organized, tightly knit, narrative. The book is punctuated with information culled from local histories and contemporary newspaper accounts that seem to have only tangential connection to events Lause otherwise so ably chronicles. When he is not regaling the reader with his erudition, Lause tells a compelling story and dispels many of the myths which have grown up surrounding this often marginalized campaign. Civil War Missouri was, in many ways, unique. It was a slave state with an ideologically divided populace that remained in the Union. Large swaths of its territory had to be occupied by chronically undermanned Federal forces in order to protect loyal citizens from their secessionist-minded neighbors. Guerrilla warfare had been endemic there since the border wars of the 1850s and personal feuds and revenge killings permeated the landscape. Into this unsettled environment Price brought about 12,000 mostly mounted men divided into three divisions commanded by Major Generals James F. Fagan, John S. Marmaduke, and Brigadier General Joseph O. Shelby. "Protected by the rugged terrain and official incredulity in the Union command,” Lause relates, “the Confederate advance moved North” toward St. Louis. To meet the threat, Department of Missouri commander, Major General William S. Rosecrans initially had about 11,000 garrison troops and state militia units of varying ability and uncertain loyalty, disbursed throughout the state. For a long time, Rosecrans didn’t believe reports about the size of the enemy force or its intended objective. Lause comes down hard on Rosecrans and other Federal commanders, contending that they were more concerned with protecting the state’s business interests than tracking down a marauding army of ragtag proletarians who posed a very real threat to the state’s rural population. Price’s men swarmed into Missouri like a plague of locusts, commandeering supplies, pilfering luxuries, conscripting “volunteers,” and murdering Unionists and anyone else deemed worth killing. While Federal forces foundered around the state, “The Army of Missouri had burned the depots, tank, and auxiliary structures up the Iron Mountain Railroad, as well as the bridges between them.” Set piece actions at Fort Davidson, Pilot Knob, Leasburg, and Jefferson City combined with the rolling tide of destruction Lause describes as being wrought on towns like Pacific, Potosi, Union, Bourbon, Stanton, Sullivan, and St. Clair. Not all the Federals were befuddled or ineffectual. Brigadier General Thomas Ewing, Jr., and his significantly outnumbered command, put up a spirited and tactically effectively defense at Fort Davidson, delaying Price’s army during the first week of it’s campaign and giving Unionists in St. Louis time to prepare the city‘s defenses. Brigadier General Egbert Brown, one of Rosecran’s district commanders, organized an effective defense of Jefferson City when Price switched his objective to the state capital. “On the outskirts of Jefferson City, Price’s expedition became the ’raid’ it was never intended to be,” Lause concludes. “There, the Army of Missouri surrendered its ambitions about recapturing the state to the pragmatic goal of plundering resources and moving on.” By November 2, it was all over. Finally pursued by Union forces, Price got what was left of his bedraggled army across the Red River, headed for Texas and safety. A campaign of propaganda and recrimination sprung up in the wake of Price’s retreat. Lause maintains that “No Confederate force in the war so systematically and consistently left such a trail of bitterness in their wake.” Radical Unionists dominated the November elections, Thomas Ewing briefly became a hero, and subsequent generations of Missourians chose to recast the bloody events of their state’s Civil War history into more traditional, honorable, terms. Mark Lause challenges us all to see things more realistically.